Nobody absorbs 100% of all nutrients consumed, due to bioavailability issues. Foods, nor supplements, are never completely digested to the point of releasing all of their nutrient and toxin content to the human body. The mere fact that everyone should have several bowel movements a day indicates that our bodies do not utilize much of what we eat. Trying to calculate quantitatively how much of each known nutrient you are getting out of your diet is both a waste of time and impossible to do. It is recommended that you do not try to quantify your intake of specific Micronutrients from your diet. Good nutrition from eating a healthy diet is the foundation of the biomedical model of natural health. Micronutrients include vitamins, minerals, phytochemicals, and water. Micronutrients do not provide any energy to the body. Micronutrients include vitamins, minerals, phytochemicals, and water. Macronutrients are carbohydrates, proteins, fats and individual fatty acids. Micronutrients do not provide any energy to the body, while macronutrients primarily provide the body with energy. Toxins contained in food are a pretty open ended concept. You should think of toxins as being any possible food negative. Certainly, a toxin would include heavy metals like aluminum, arsenic, mercury, and lead. Food negatives and toxins include other things like goitrogens, oxolates, and even Maillard reactions introduced by browning foods during the cooking process. You may be tempted to look up your diet in a food database, or with a computerized diet program. Analyzing your diet is appropriate for macronutrients, but would be largely inaccurate for your micronutrients. You could indeed spend a considerable amount of time generating numbers regarding how much of each nutrient you are currently getting from your diet. However, what would your numbers really mean? Not very much, in the opinion of the Natural Health Perspective. Before you could be accurate, you would need to know not only the nutrient composition of foods, but also all sources of potential losses to those nutrients. "Nutrients ingested but not released during the digestive process for absorption are of no nutritional value." "An assessment of the adequacy of dietary intakes of nutrients requires not only knowledge of the nutrient content of the foods ingested but also the extent to which the nutrient present in the diet is available for absorption and utilization." Bioavailability is the technical term used to convey the fact that you do not absorb 100% of all nutrients and toxins consumed no matter if you take them in the form of nutritional supplements or as food. In fact, you may absorb from food, close to none of some nutrients and toxins. "The term 'bioavailability' attempts to include in a single concept the effect of a sequence of metabolic events, i.e., digestibility, solubilization, absorption, organ uptake and release, enzymatic transformation, secretion and excretion." A number of factors affect bioavailability: factors contained in the food itself, factors of human physiology, factors specific to your health status, and factors related to the food processing. Food Related Factors -- "The bioavailability of a nutrient can, in some cases, be significantly influenced by the chemical form in which it appears in the diet and by the presence of other factors in food that may enhance or depress mineral absorption and utilization." "While most vitamins are very well absorbed [from food], most essential minerals are not. Usual absorption of minerals ranges from less than 1% to over 90%. The bioavailability of dietary minerals must be considered when determining whether the diet contains enough, too little, or too much." Human Physiology Related Factors -- "Various nutrients and dietary components interfere with the bioavailability of vitamins. Hence, requirements for vitamins cannot be considered independently, but must be evaluated in relationship to other nutrients and compounds consumed by an individual." Nutrients compete with other nutrients for absorption. Some nutrients will either enhance or reduce the amounts of other nutrients being absorbed by your body. This is especially true for all the oil-soluble nutrients. The relatively tiny distal ileum or the very end of the small intestine, where it turns into the large intestine, is where most of the oil soluble nutrients are absorbed by the human body. When the ileum absorbs retinol, for example, it effectively blocks vitamin D from being absorbed. Health Status Related Factors -- Good digestion is a requirement for natural health to work. Probiotics can be used to improve your intestinal tract health in order to enhance the bioavailability of some nutrients. You may also have a genetic defect that adversely affects the absorption of specific nutrients. Negative Toxin Related Factors -- What is true for the good stuff is likewise true for all negative factors contained in your food. Just because fish is reported to contain mercury does not mean that your body will absorb most, or even any of it, any more than all the calcium content would be absorbed. Food Processing Related Factors -- There is no best way to prepare food. Boiling food, for example, depletes more of its iodine content than baking does. Consuming fruits and vegetables raw enhances the absorption of some nutrients, whereas soaking and fermentation will increase the absorption of minerals in legumes and grains to the detriment of the water-soluble nutrients. Cooking by breaking down fiber generally increases digestibility of many nutrients, while all the oil soluble nutrients require the presence of fat for best absorption. In conclusion: Trying to calculate quantitatively how much of each known nutrient you are getting out of your diet is both a waste of time and impossible to do There are simply too many factors evolved. Thus, it is recommended that you do not try to quantify your intake of specific Micronutrients from your diet. "It will therefore require major research programs before the term 'bioavailability' of a nutrient can become a quantitative concept useful for clinical, nutritional or managerial evaluation and counseling." The best approach to optimizing your diet is to follow the simple dietary rules of thumb provided elsewhere on this Web site. Because fruits are normally eaten raw, they are the primary source of many water-soluble / living nutrients your diet. Bran, which may contain the most important bioactive nutrients. "The long list of cereal antioxidants includes vitamin E, tocotrieonols, selenium, phenolic acids, and phytic acid. These multifunctional antioxidants come in immediate-release to slow-release forms and thus are available throughout the gastrointestinal tract over a long period after being consumed." B vitamins, vitamin E, selenium, zinc, copper, and magnesium. 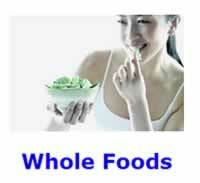 See Health Benefits of Whole-Grains for additional information. Vegetables are normally eaten cooked in order to break down fiber and to destroy toxins. Thus, they are the primary source of many nutrients that are improved by the cooking process. Allium vegetables (onion, garlic, leek, chive).